Major findings: 41 species of insects were found in Jatropha fields. The flee beetle that is known to harm Jatropha was found at almost all locations. The data showed that planting date has effect on the insect density years after the Jatropha has been established. If planting is done when the pest pressure is high during the first months of the year the pest pressure will be high in the same field years later. Selecting the right planting time can therefore be one of the pest control measures. The rapid survey conducted earlier had shown that there are pest problems in Jatropha. However, there was hardly any records in the literature about pest in Jatropha. In collaboration with Luísa Santos from UEM it was decided to undertake a baseline survey of insects in Jatropha as a starting point. It is important to understand that not all insects found in Jatropha are pests to Jatropha. This issue was left for later research. The research was undertaken by Pomme Christiane Gagnaux as thesis work. Flemming Nielsen with logistic support from Danida and IIAM helped out with the field sampling. Due to the great interest in this baseline study an attempt was made to extend the coverage as much as possible. Jatropha fields located in 11 districts spread over five provinces namely Maputo, Manica, Sofala, Zambezia and Cabo Delgado were sampled. The study was conducted in three phases: the first was to survey the incidence and density of species, as well as collecting information on the perception of farmers about their occurrence, damage and control strategies adopted by them. Additionally, information was collected about the fields, using a questionnaire, including location, soil type, irrigation use, fertilizing, spraying, planting date and seed origin. A GPS was used to register the geographical coordinates of each field. The second phase consisted of identifying the samples collected in the field with the help of skilled personnel in the field of Entomology and the literature review on the species found. The third step involved the analysis of data. 41 species of insects were found. The most frequent species was the flee beetle Aphthonia dilutipes (Jacoby), which is commonly called Yellow Leaf Beetle or Yellow Flee Beetle, and reported for the first time in Mozambique. 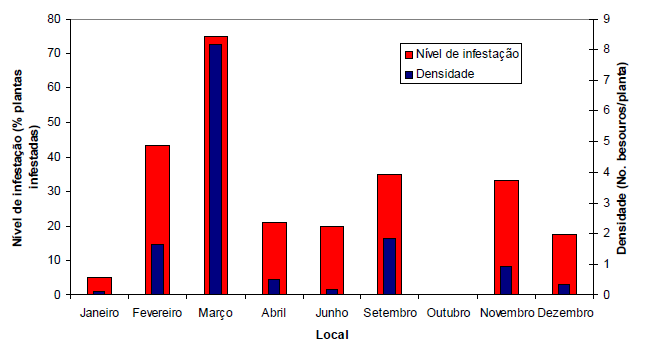 The levels of infestation and population density of flee beetles in farmers' fields varied, with only seven sites in Cabo Delgado Province where the species was absent. Elsewhere infestation levels ranged from 10 to 75% infested plants. Other important species found was the Caterpillar Green Leaf Mining, Stomphastis thraustica (Meyrick), reported for the first time in Mozambique, which occurred in 30% of the observed fields. The district Meluco had the highest infestation levels, reaching 70% of infected plants. The control strategies for the Yellow Leaf Beetle include the manipulation of planting date, performance of deep plowing, and the use of botanical pesticides and pesticide applications. Further research is needed to verify the efficacy of these methods.